While frozen blueberries are perfectly fine for this light blueberry crisp, fresh plump blueberries will turn from a dusky blue to a deep purple as they're cooked. 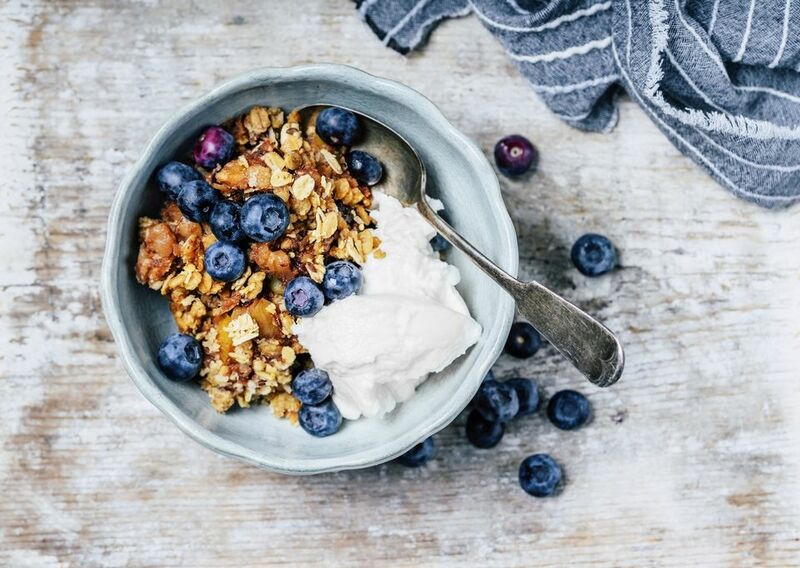 Enjoy this light blueberry crisp with a warm low-fat custard sauce, or with some frozen vanilla yogurt. Preheat oven to 375 degrees. Place blueberries in a large bowl with cornstarch, sugar and lemon juice. Toss well and leave for a few minutes. Empty blueberries into an 8 x 8-inch baking dish. In a medium bowl stir oats, flour, brown sugar, and salt together. Use two forks or a pastry blender to cut the butter into the oat mixture. Top the blueberries with the oat mixture. Yes, You Can Bake Delicious Custard in Your Slow Cooker!